Tämän PNG-esikatselun koko koskien SVG-tiedostoa: 630 × 360 kuvapistettä. Muut resoluutiot: 320 × 183 kuvapistettä | 640 × 366 kuvapistettä | 800 × 457 kuvapistettä | 1 024 × 585 kuvapistettä | 1 280 × 731 kuvapistettä. Deutsch: Flagge des Irans. Die dreifarbige Flagge wurde 1906 eingeführt, aber nach der Islamischen Revolution von 1979 wurden die Arabische Wörter 'Allahu akbar' ('Gott ist groß'), in der Kufischen Schrift vom Koran geschrieben und 22-mal wiederholt, in den roten und grünen Streifen eingefügt, so daß sie an den zentralen weißen Streifen grenzen. English: Flag of Iran. The tricolor flag was introduced in 1906, but after the Islamic Revolution of 1979 the Arabic words 'Allahu akbar' ('God is great'), written in the Kufic script of the Qur'an and repeated 22 times, were added to the red and green strips where they border the white central strip. The official ISIRI standard (translation at FotW) gives two slightly different methods of construction for the flag: a compass-and-straightedge construction used for File:Flag of Iran (official).svg, and a "simplified" construction sheet with rational numbers used for this file. Français : Drapeau d'Iran. Le drapeau tricolore fut introduit en 1906, mais après la révolution islamique de 1979 les mots Arabes 'Allahu akbar' ('Dieu est grand'), écrit dans l'écriture coufique du Coran et répétés 22 fois, furent ajoutés aux bandes rouges et vertes où elles joignent la bande blanche centrale. Español: Bandera de Irán. La bandera tricolor fue introducida en 1906, pero tras la Revolución Islámica de 1979 se añadieron las palabras árabes 'Allahu akbar' ('Dios es grande'), escritas según la escritura cúfica del Corán y repetidas 22 veces, a las bandas roja y verde en su encuentro con la banda central blanca. Italiano: Bandiera dell'Iran. La bandiera tricolore venne introdotta nel 1906, ma dopo la Rivoluzione Islamica del 1979 furono aggiunte le parole arabe "Allah akbar" ('Dio è grande'), scritte nel Corano, e ripetute 22 volte sui bordi interni delle strisce verde e rossa. Tamazight: Acenyal anamur n Tagduda Tislamant n Iran. Nederlands: Vlag van Iran. De driekleurige vlag werd geïntroduceerd in 1906, maar na de Islamitische revolutie van 1979 werden de Arabische woorden 'Allahu akbar' ('God is groot'), geschreven in het Koefisch schrift van de Koran en 22 maal herhaald, toegevoegd aan de rode en groene strepen waar ze aan de centrale witte streep grenzen. Päiväys 29 July 1980 (adopted). The creator(s) died before 22 August 1980, for works that their copyright expired before 22 August 2010 according to the 1970 law. In cases where the work belongs to a legal person or rights are transferred to a legal person. The media description page should identify which reason applies. For more information please see: Commons:Copyright rules by territory/Iran. 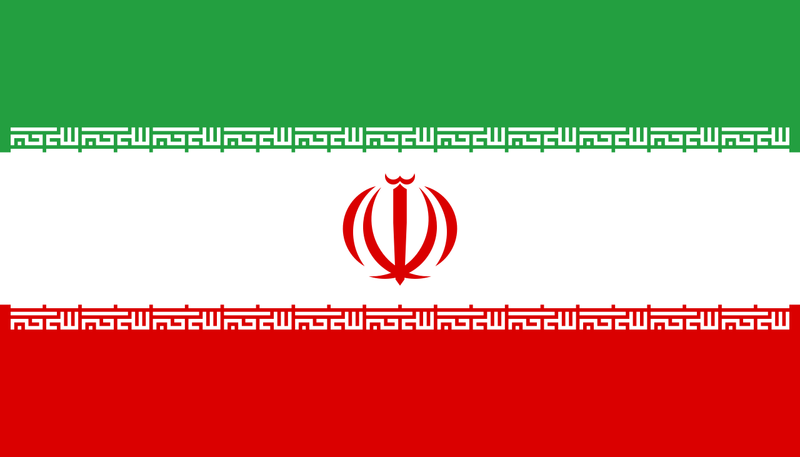 Katso myös: en:Flag of Iran. Katso myös luokat: SVG flags of Iran ja SVG flags - military of Iran.